Nothing written on it. Model: TI-84 Plus. Power Source: Battery. Fast & Easy. Texas Instruments TI-85 Graphing Calculator. Condition is Used. Original owner’s manual included. Texas Instruments BA-II Plus Scientific Calculator!!! GENUINE Texas Instruments BA-II Plus Scientific Calculator. Condition is Used. Dispatched with Royal Mail 1st Class. Used just for my CFA exams! 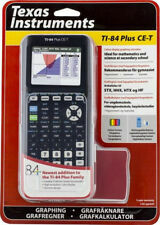 4.5 out of 5 stars - Texas Instruments BA-II Plus Scientific Calculator!!! 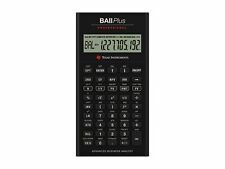 22 product ratings22 product ratings - Texas Instruments BA-II Plus Scientific Calculator!!! TI also produces TI digital light processing (DLP) technology and education technology. GENUINE Texas Instruments BA-II Plus Scientific Calculator. Great condition and fully working! Dispatched with Royal Mail 1st Class. ti-89 titanium texas instruments graphing calculator . Condition is Used. Dispatched with Royal Mail 1st Class. Takes 2 lithium cr2032 batteries ( included). Equation Recall feature allows recalling, viewing, editing and correcting previous entries and statistical data. Up to four line MultiView Display. Multi-line screen for illuminating patterns or differences in maths or even seeing previous calculations. Computes profit and loss, breakeven calculations, interest conversions and delta %. One or two variable statistics with 4 regressions options: linear, logarithmic, exponential and power. Computes NPV and IRR. Faulty Goods. Orders Not Received. Argos will then notify you when your order is ready for collection. The TI-80 runs on 2 x CR2032 batteries whilst the TI-81 uses 4 x AAA batteries. 134 scientific functions. Argos will then notify you when your order is ready for collection. One-variable statistics. Up to four line MultiView Display. Basic scientific, trigonometric and hyperbolic functions. Multi-line screen for illuminating patterns or differences in maths or even seeing previous calculations. Two-variable statistics: Enter/delete/insert/edit individual statistics data elements. Equation Recall feature allows recalling, viewing, editing and correcting previous entries and statistical data. Allows operations with fractions and decimal views. Data editor for entering lists of data. List function: to apply a function to a list of values. Radicals shown, to work with simplified radicals and to rationalise the denominator Exponents with superscript notation. Engineering and scientific notations. Argos will then notify you when your order is ready for collection. 30XA is also available with solar power (TI-30 ECO RS). Retro Texas Instruments TI-55-II Vintage Calculator & Case. Condition Fully Working With New Batteries Fitted Both Calculator & Case are in very good condition plastic hinges both intact. This 1-line scientific calculator is designed for the early secondary classroom. TheTI-30 Eco RS is solar powered and has 100% recycled plastics. Conversion of polar to rectangular coordinates, and conversion of degrees, minutes and seconds into decimals. Solar and battery powered to work anywhere. Angled, LCD SuperView display with large digits (14 mm) for easy viewing. Well-spaced keyboard with large, contoured keys for easy operation. Argos will then notify you when your order is ready for collection. 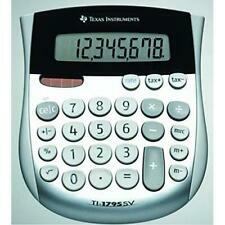 This calculator has been tested & is fully working. (LIGHT POWERED). NO BOX OR MANUAL 0R CASE. 10-digit display. 1-variable statistic. Engineering and scientific notations. Conversions: Fractions/Decimals; Degrees/Radians/Grads; Degrees-minutes seconds/Decimal/Degrees. Hard plastic tamper-proof keys. The TI?30XA is also available with solar power (TI-30 ECO RS). Type: Printing. Colour: Multi. Main Colour: Multi. Bond prices and yield to call or maturity. The keys show little signs of wear and I can't see that any of the print on either the keys, or calculator body is missing. See pictures above for a better view.